Windows Mango Review: Beautiful, Functional, But Where Are The Apps? When I was growing up, Mango was not a fruit to be enjoyed with sticky rice, nor a color that bridesmaids look terrible in, nor the latest, much-ballyhooed release of the Windows Phone operating system currently rolling out to WP device owners. No, Mango was something much different: It was the name of a scantily-clad, ambiguously gay, vaguely Hispanic male gogo-dancer played by Chris Kattan on "Saturday Night Live." For those who missed all of the Mango sketches of the late 90s (here's a typical one with Christopher Walken), they followed the same basic thread: This dancer Mango, who is not very good looking or very nice to his fans or even a very good dancer, is for some unknown reason, totally irresistible to any man who lays eyes on him, to the point of fanaticism and tunnel-visioned obsession. Though Microsoft has named its mobile OS update "Mango", it is certainly not the SNL "Mango" of the mobile landscape; that distinction belongs to the iPhone, which, no matter what you think of its looks or usability, is the only smartphone out there that can whip the public into a frenzy like the Chris Kattan character spanking himself in a burlesque club dressing room. Leave it to Apple to announce its iPhone-centric media event just two hours before the official release of Mango, jumping into the spotlight with arms spread wide open ahead of Microsoft's OS update rollout. But Microsoft's update to Windows Phone 7 deserves its time in the bright lights, too. Despite not appearing in the Everything But The Girl-soundtracked daydreams of America, Mango (the mobile OS) is a beautiful, smart and different option for buyers looking for some color and some change to their smartphone experience. Not to downplay its intelligence, but seriously: Mango's greatest strength is its looks. The thing is gorgeous. Transitions between screens are seamless, app icons are large and friendly and each screen looks as though it were painstakingly conceived by some talented hipster graduate student in design and typography. It all looks tremendous; I mean, if Windows Mango were a woman, it would go to clubs that I couldn't get into. That's how great this thing has come together visually. It is, quite easily, the most aesthetically attractive mobile OS out there today. Beauty, however is nothing without brains, of course, and Windows Mango is certainly going to miss a few problems on the SAT. Its selection of apps is depressingly meager. There are about 30,000 apps in the Windows Marketplace compared to more than 425,000 in the iOS App Store and more than 250,000 in the Android Market; product managers for Microsoft tried to spin this shortcoming by explaining that it was the quality, not the quantity, and that they believed everything one could want on any smartphone was available in their Marketplace. They're wrong. I've been playing with various builds of Mango for about three months, and the lack of apps can make the Windows Marketplace feel like a ghost town. There's no Spotify. Facebook Messenger has not yet arrived, nor has Pandora. The cross-section of sports scores apps is pathetic. Big companies just are not putting the time into Windows Phone app development that they do into Android and iOS. It is a huge problem for Microsoft, and the largest weakness of the Windows Phone by acres. Depending on your point-of-view, that by itself might be enough to forgo a Microsoft phone in favor of an apped-up OS. Why not just make those bubbles bigger so that they can include the captions in the first place? 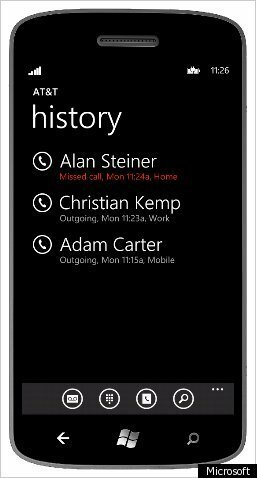 Everything else in the Windows Phone OS is so large and accessible; why not the main buttons on the phone screen? Beauty was given more importance over brains in that decision. (The bubbles, by the way, call up Voicemail, Keypad, Phonebook and Search functions). That's a fairly minor complaint, however, once you consider that Mango nails just about every other aspect of the phone that Microsoft has jurisdiction over. The combination of all messaging platforms -- Facebook messaging, chat and SMS -- all located in one hub should catch on soon with competitors. The integration of a contact's multiple profiles -- from Twitter and Facebook and your phonebook and elsewhere -- is terrifically helpful for contacting everyone you know. Visual voice mail and WiFi hotspot are two welcome new additions. The keyboard continues to be great: Making corrections in emails and text messages, with an actual desktop cursor that pops up, is a welcome respite from having to peek over one's thumb in Android and iOS. Bing Maps, with traditional map view, street-level view, traffic information and indoor maps for shopping malls and baseball stadiums, really blows its competitors' maps out of the water in terms of function and features. And then there is TellMe, which is one of Windows Phone's best features, and which is the last of the hundreds of updates Microsoft is rolling out with Mango. Earlier this week, the Internet freaked out, as though having seen a Chris Kattan male dancer character slap his upper thighs, with rumors that voice commands would be heavily integrated into iOS 5; TellMe is everything that this "iPhone Assistant" is rumored to be (minus a Find My Friends feature). After holding down the home button and speaking a command, the TellMe feature can make phone calls, write and send text messages and read out received text messages, launch apps and retrieve and read out walking and driving directions turn-by-turn. The speech recognition worked great in my trials, and I didn't get arrested once for texting while driving. TellMe is basically everything the rumored Assistant will purportedly do, but the Microsoft's version exists without the fanfare of its Apple counterpart. The cynic in me says that this is a microcosm (Microsoft-cosm?) for the new Windows mobile OS compared to iOS (minus, again, about 400,000 apps), and that Windows Phone Mango, no matter how good it becomes, will always be overshadowed by its flashier, more lusted-after competitor. Perhaps Microsoft should have dressed up its own Mango in a spangled beret and gold lamé hot pants; it has certainly tricked it out with almost everything else. Check out some of the new features of Microsoft's upgrade to its Windows Phone platform (below). This is the front screen of Mango (colors can be changed, red-haters). Everything you see that isn't solid red is a live tile, meaning the images move around and change.